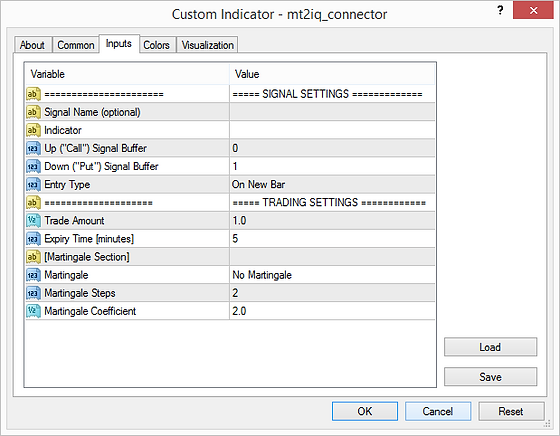 The signal connector acts like a bridge between the MetaTrader terminal and MT2IQ bot. The connector gets linked to your binary option indicator and sends its signals to MT2IQ bot, where the trades are placed accordingly to the received signals on your trading account. The signal connector (file: MT2IQ_Connector.ex4/ex5) you can find in the download archive of the MT2IQ bot. Copy this file to the Indicators subfolder of your MetaTrader terminals data folder (open MetaTrader menu "File\Open Data Folder" navigate to the folder "MQL4\Indicators"). On terminal restart you should see the connector in the indicators list. For connecting any binary options indicator attach the connector to the chart and define the connector inputs. The inputs are divided into the signal settings and trading settings. In following we describe every input in detail. The signal name is an optional input. It is used to distinguish signals from each other and show the signal names in the trades table. The statistics and the trades history are also based and sorted according to the signal names. Enter the indicator name (file name of the connected indicator that produces signals). Pay attention to enter the indicator name correctly (upper and lower case sensitive). If your indicator is located in the Indicators folder of your terminals data folder (MQL4\Indicators), so you just need to enter the file name of the indicator. But if the indicator is located in the sub folder of the Indicators folder (e.g. 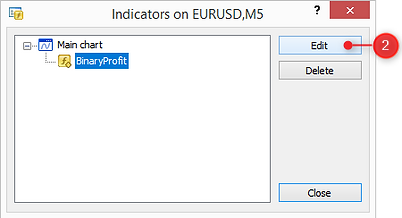 MQL4\Indicators\Market) so put the sub folder name followed by double backslashes (e.g. "Market\\") before the indicator name. Attach indicator to the chart. 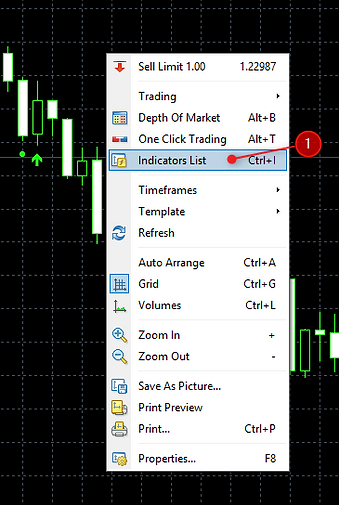 Then open the context menu (right mouse click) and select Indicators List. Select the Indicator and click Edit. In the indicators settings dialog go to the Colors tab and see the indicators buffers. In the Colors tab we see all available signal buffers. Two of them are the buffers for the Up ("Call") and Down ("Put") signals. In the left column there is a number (beginning from 0) that corresponds to the indicator buffer. In order to figure out what buffer number states for Up and Down signals, we should compare the signal colors on the chart with the colors defined in the buffers list (Colors). Sometimes the color for both signals is same, so we can change the colors manually to distinguish the signals from each other. In the example above (indicator BinaryProfit) we see 4 signal buffers: 2 are for the dot signals and 2 for the arrow signals. The dot signals are indicating the trade entry on the next bar and the arrow signals are indicating the trade entry as intrabar (same bar). Depending on the entry type we can link the connector to the dots or to the arrows. Linking the connector to the dots (buffers 0-Up, 1-Down) we will need to select the entry type "on next bar". Also we can link the connector to the arrows and select then the entry type "intrabar". The result would be here the same, because the arrows are appearing here (BinaryProfit indicator) at the beginning of the new bar. As already described above, there are two types of entries: on new bar and intrabar entry. On new bar entry means that the trade should be placed after the candle bar with the signal gets closed (i.e. on opening of the new bar). And intrabar entry means that the trade should be placed immidiatelly when the signal appears. What kind of entry should you use depends on the indicator. Most reversal indicators generate signals for entry on the new bar, while the trend indicators generate commonly signals for intrabar entry. But it can vary, therefore just look on the chart signals and estimate what kind of entry is best for your indicator. By default the martingale is turned off. If you want to use martingale trading strategy you can activate martingale by selecting the martingale type. Therefore change the martingale input from "No Martingale" to one of the following martingale types. Martingale "On next expiry" means that martingale will be applied straight after the close of the current trade. Martingale Type "On next signal" means that martingale will be applied only on the next signal of the same currency pair. Martingale Coefficient: Defines the multiplicator for the calculation of the trade amounts for the martingale seties. The new trade amount after the loss is calculated by multiplication of the previous trade amount by the martingale coefficient. If you have connected your indicator correctly you should see the connector label on the charts bottom with the indicator name followed by the trade amount and expiry time in the brackets. In order to disable the connector temporarily you can uncheck the checkbox left of the connector label. The red text label color states for an indicator connection error. In this case check whether the indicator input is not empty or the indicators file name is entered correctly.